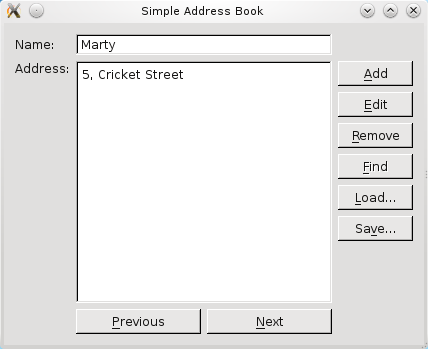 This part covers the Qt file handling features we use to write loading and saving routines for the address book. 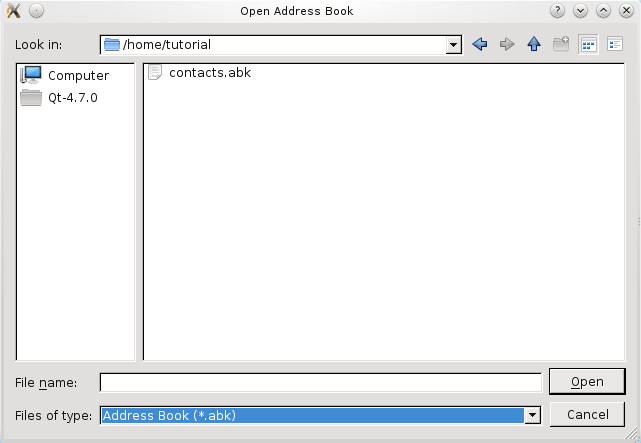 Although browsing and searching the contact list are useful features, our address book is not complete until we can save existing contacts and load them again at a later time. Qt provides a number of classes for input and output, but we have chosen to use two which are simple to use in combination: QFile and QDataStream. A QFile object represents a file on disk that can be read from and written to. QFile is a subclass of the more general QIODevice class which represents many different kinds of devices. A QDataStream object is used to serialize binary data so that it can be stored in a QIODevice and retrieved again later. Reading from a QIODevice and writing to it is as simple as opening the stream - with the respective device as a parameter - and reading from or writing to it. We declare two public slots, saveToFile() and loadFromFile(), as well as two QPushButton objects, loadButton and saveButton. Although it is not shown here, just like the other features we implemented, we add the push buttons to the layout panel on the right, buttonLayout1, and we connect the push buttons' clicked() signals to their respective slots. For the saving feature, we first obtain fileName using QFileDialog::getSaveFileName(). This is a convenience function provided by QFileDialog, which pops up a modal file dialog and allows the user to enter a file name or select any existing .abk file. 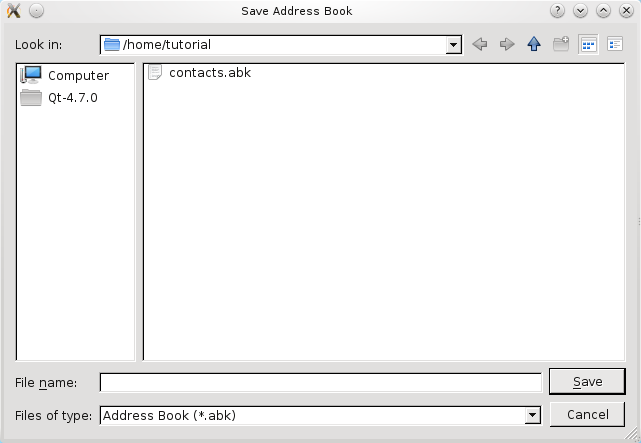 The .abk file is our Address Book extension that we create when we save contacts. If fileName is not empty, we create a QFile object, file, with fileName. QFile works with QDataStream as QFile is a QIODevice. Next, we attempt to open the file in WriteOnly mode. If this is unsuccessful, we display a QMessageBox to inform the user. Otherwise, we instantiate a QDataStream object, out, to write the open file. QDataStream requires that the same version of the stream is used for reading and writing. We ensure that this is the case by setting the version used to the version introduced with Qt 4.5 before serializing the data to file. For the loading feature, we also obtain fileName using QFileDialog::getOpenFileName(). This function, the counterpart to QFileDialog::getSaveFileName(), also pops up the modal file dialog and allows the user to enter a file name or select any existing .abk file to load it into the address book. On Windows, for example, this function pops up a native file dialog, as shown in the following screenshot. If fileName is not empty, again, we use a QFile object, file, and attempt to open it in ReadOnly mode. Similar to our implementation of saveToFile(), if this attempt is unsuccessful, we display a QMessageBox to inform the user. Otherwise, we instantiate a QDataStream object, in, set its version as above and read the serialized data into the contacts data structure. The contacts object is emptied before data is read into it to simplify the file reading process. A more advanced method would be to read the contacts into a temporary QMap object, and copy over non-duplicate contacts into contacts. To display the contacts that have been read from the file, we must first validate the data obtained to ensure that the file we read from actually contains address book contacts. If it does, we display the first contact; otherwise, we display a QMessageBox to inform the user about the problem. Lastly, we update the interface to enable and disable the push buttons accordingly.